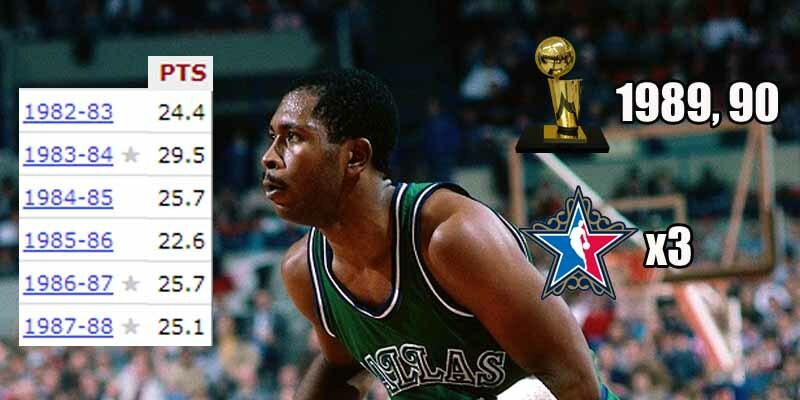 Expansion teams don’t often become a threat from the get-go, but that’s what happened with the Mavericks with Mark Aguirre as their top scorer. Outside of his rookie season, his PPG averages for Dallas were mid to high 20s. He was a true offensive juggernaut of the 1980s. With the combined efforts of Aguirre and Rolando Blackman, the Mavs made the post-season from 1983 to 1988. In 1988, they went as far as the Conference Finals and took Magic’s Lakers to seven games. Being traded to the Pistons got him a couple of rings, but reduced his role to the point where he would probably never make it to the Hall of Fame or become a household name.